There always was an ominous presence that lurked within Jefferson Airplane’s music. It could be found powering its way through the surreal realm of White Rabbit’s twisted psychedelia or buried beneath the funky groove of Plastic Fantastic Lover, Marty Balin’s sly commentary on the entrancing power of television. Nevertheless, the band tempered its dangerous edge, at least in its early days, by also offering its reflections upon love that either had been lost or found. By 1969, however, the socio-political climate in America had changed dramatically, and Jefferson Airplane’s music had moved right along with it. Fueled by a fascination with science fiction and an air of impending doom, the group’s material had turned considerably darker in tone, and its live performances had assumed an increasingly aggressive persona. In effect, the peacefulness that once had emanated from the "Summer of Love" had given way to the tense unrest that followed the assassinations of Martin Luther King, Jr. and Robert F. Kennedy as well as the continued heightening of the war in Vietnam. 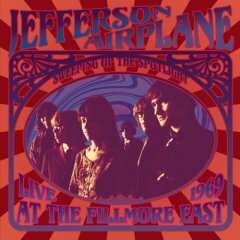 Recorded over the course of two nights in late November 1969 at Bill Graham’s legendary Fillmore East, Jefferson Airplane’s Sweeping Up the Spotlight is a reflection of the times in which it was created. Two of its tracks — Good Shepherd and Plastic Fantastic Lover — were included as bonus cuts on the expanded edition of Volunteers that was issued a few years ago, but on Sweeping Up the Spotlight, the brute force of the ensemble’s intensely raging attack can be felt in full. Nearly every song that is featured on the set is marked by its chaotic energy. The title tune from Volunteers, for example, was a stampeding inferno of anarchic fury that served as a rough, rowdy, and ragged call-to-arms, while the growl in Jorma Kaukonen’s voice combined with the nervousness of his quivering, acid-drenched guitar licks made the subsequent Good Shepherd far more menacing than its studio counterpart. Later, the band came storming, teeth bared and instruments flashing like knives, through a manic rendition of 3/5 of a Mile in 10 Seconds, while a cover of Fred Neil’s The Other Side of this Life smashed a snarling blues motif against a 12-string clatter that was reminiscent of The Byrds’ 8 Miles High. There are a few moments when Sweeping Up the Spotlight loses its momentum. The Wilson Pickett-style soul of You Wear Your Dresses too Short initially was unfocused, though by its conclusion, the song had gained a full head of steam as Kaukonen’s guitar poked and prodded its way through the churning rhythm that was being laid down by bass player Jack Casady and drummer Spencer Dryden. Won’t You Try/Saturday Afternoon, Paul Kantner’s fond reflection upon the hippie scene in Golden Gate Park, wasn’t nearly as fortunate. Its sun-dappled beauty was unable, perhaps, to stand its ground amidst the mayhem that was being unleashed during the other portions of the set, and despite Grace Slick’s booming, powerhouse vocals, White Rabbit felt like an obligation. History, of course, has shaded Jefferson Airplane’s performance at the Fillmore with greater meaning, and the passage of time has opened Sweeping Up the Spotlight’s contents to a broader interpretation. Those in attendance on these two November evenings in 1969 likely felt as if they were witnessing a potent celebration that provided for the safe release of their pent-up agitation. In hindsight, however, it is much easier to see the darkened storm clouds that were gathering on the horizon. The feeling of peace and love that had culminated at Woodstock and had typified the 1960s was about to come to crashing conclusion, and the angst-filled violence that filtered through the music at these shows served as a prelude to the disastrous events that occurred at the concert held just a week later at the Altamont Speedway in Northern California.